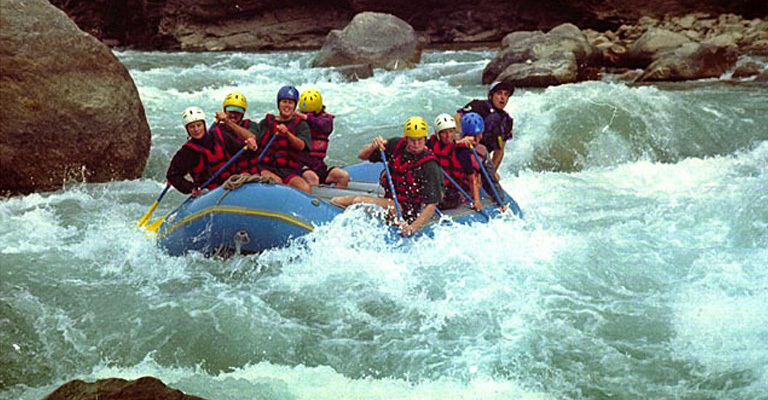 White water rafting means cruising down a rushing river in an inflatable rubber raft or white water kayak over crashing waves and swirling rapids for the excitement of a lifetime. Nepal has earned a reputation as one of the best destinations in the world for white water rafting. The Trishuli River (grade 3+) is one of the most popular, if not favorite, of Nepal's raftable rivers. Many choose to incorporate a ride down the Trishuli with either a trip to Pokhara or to the royal Chitwan National Park. Seti River ( Grade 2+) 02 - days trip. The most finest river offers beautiful scenery of nature , tremendous excitement of white water rafting, wonderful villages. Five hours drive from Kathmandu to rafting put in point at Damauli , the rafting trip starts in Damauli and ends at Gaighat. Drive back to Kathmandu or continue tour for wild life safari at Royal Chitwan National Park will be the option after the termination of the trip. The Kali Gandaki (4 to 6+) winds through remote canyons and deep gorges for five days of intense rapids among gorgeous wilderness and mountain views. The Bhote Koshi (4 to 5) twenty-six km of continuous white water batters rafters as they shoot through a veritable maze of canyons and boulders. The raging Marshyangdi (4 to 5) the first 90 Km are spend flying through spectacular landscapes and narrow gorges and down some of the most challenging rapids in the world. for the remaining 90 Km, the scenery and wildlife are the main attraction. The Sun Koshi (4 to 5) runs is 270 Km and requires 8 to 10 days to complete with road access only at the beginning and end. Karanali River (Grade 4-5) This is one of the longest and largest wilderness river in far west of Nepal exploring beautiful villages, culture, magnificent views of the Himalayas, a unique chance to have a look of wild animals. The trip starts in Karalighat/Sauli combined with 02 - days short trek from Surekhet (Nepalgunj) and ending at Chisapani. The option tour is available for wild life safari at Royal Bardiya National Park which has not been long opened for tourists. Tamur River (Grade 4-5) The Tamur river one of the finest rivers combined with three days trek offers spectacular views of Himalayan, landscape, beautiful scenery of mother nature and a unique chance to mix with the local people and get an insight into their livelihood and culture with an exhilarating river expedition. Fly to Biratnagar either drive to Basantapur. The trip starts in Dovan and ending at Chatra. Some people prefer rafting on the river on the way back from Kanchanjunga trek.